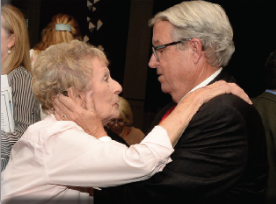 More than a hundred admirers including residents, business persons, Lessees, boat owners and public officials attended the gala thanking Supervisor Don for his dedicated and conscientious oversight of Marina del Rey. 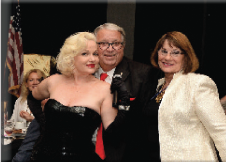 Produced by a coalition of community organizations, net proceeds of the event help fund the Marina del Rey Historical Society’s[MdRHS] goal to collect and preserve Marina del Rey history. Following the Presentation of Colors by Marina del Rey Sea Scouts Ship 16 “Islander”, a moving invocation delivered by longtime boat charter Captain Alex Balian, touched upon the Marina’s overwhelming appreciation for Supervisor Knabe’s exquisite business expertise in caring for all things MdR. Captain Balian also gave a very big tribute to Greg Wenger, and wife Mimi, for Greg’s years of community service culminating in founding of the MdRHS. is responsible for 145 babies being saved. Small Craft Harbor Commissioner rounded out the official thank yous to Supervisor Knabe. MdRHS gifted the Knabes with a framed 1962 painting reproduction (#2 of 400 giclee limited prints) of the Marina being dredged. The original oil was painted by artist JoAnn Cowans from her balcony atop Playa del Rey. She had been saving #2 for a very special event, and this was it! 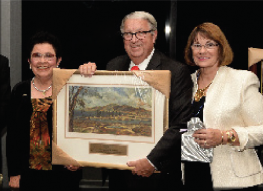 Thank you JoAnn for this very fine art quality memento which will hang in Supervisor Knabe’s Cerritos history museum. A huge THANK YOU goes to the COMMITTEE for their overwhelming success in creating a very memorable and joyful TRIB UTE! The Marina del Rey Historical Society extends a debt of gratitude to all TRIBUTE! sponsors and attendees for their sponsorship and continued support.